After a prolonged period of good times, it is time to tighten your purse strings. BT tells how. The need to live within our means and save for the future is something that is imbibed into us from early stages of our lives. It is just that a prolonged period of good times has made us a little lackadaisical when it comes to controlling our spending. Chinese philosopher Confucius’ words are all the more relevant today as clouds of uncertainty hang over our future. For some, this means a possible job loss. For many, a pay hike next year that may, at best, match the rate of inflation, if not lower. While we are not facing a doomsday scenario, time has clearly come for us to revisit our expenses. Like how a lean company survives downturn the best, a family that controls its spending handles a difficult time without having to significantly compromise its living standards. While the situation is not bad enough for you to sell your car and take public transport, restricting the usage of car could well be a good option. Car pooling among colleagues who live in the same locality can actually bring about significant savings. Assuming your office is about 15 km away and you decide to go with your friend (and take him) three times a week, you will be surprised that the ensuing savings is about Rs 2,000 a month. If you have a driver, you may well consider using him part-time, thus saving another Rs 3,000 or so. Reducing the car usage also lowers possible repair costs. Time is not right yet to swap a housing loan as interest rates are set to fall. Wait for it to happen and swap your loan if your interest (fixed or floating) is higher than what other banks offer. In the interim, you can prepay part of the loan (if you are sitting on some cash) so as to bring your interest outgo to Rs 1.50 lakh (the amount up to which tax breaks are available). Depending on the amount of prepayment, your EMI will also reduce. Also, if you have piled up huge credit card debts, convert them to personal loans at a saner rate of interest. For many, weekend outing has become a habit—be it a visit to a restaurant, pub or movie theatre. It typically costs a minimum of Rs 2,000 (a lot more if you take your friends for a drink) a week and may total up to even Rs 10,000 a month. Weekends can be fun at home, too, with friends and home cooked food. Try experiencing it. This also brings about significant savings. How many times have we purchased something that we regret buying soon thereafter. It could well be a new mobile phone, a costly watch, jewellery, dress, DVDs etc. When the going is good, it is okay to listen to your heart. But when things get difficult, it is time to listen to the mind. Before every major purchase, ask the question: Do I really need it? You will be surprised that an affirmative answer to this question is quite rare. CREDIT CARD USAGE A credit card itself is not evil, if managed properly. Using it in lieu of cash and paying the dues in full at the end of the statement period is actually beneficial. But if you are a chronic overspender, it makes sense to leave the credit cards at home. 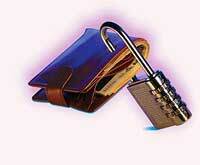 Debit cards are a better option as one cannot buy more than the cash available at bank. Better planning cuts vacation costs. Many websites offer excellent travel and accommodation deals. Don’t choose packaged tours as the operators typically charge a premium for organising it. Also, travel offseason. “Beware of little expenses. A small leak will sink a great ship,” Benjamin Franklin once said. Groceries fit into this category. Savings per item may be small but sum total of all of them will be significant. Some intelligent shopping will help. Do not blindly go to your favourite supermarket and pick your favourite brands. Look around for best deals. With demand slowing, retail majors will offer attractive schemes to attract customers. Also, not so popular but quality brands may offer attractive discounts. Not always does one’s cellphone plan matches his usage pattern. For instance, you may be an SMS freak sending over 1,000 SMSes a month but may not be aware that there are plans which offer unlimited SMS for a fee of just Rs 75 per month! Same goes for the landline at home. In fact, if every one at home has a mobile, you can even consider giving up the landline. Broadband plans, too, need check. You may be a rare surfer of the net at home but would be on a broadband connection that offers unlimited download costing over Rs 1,000. By switching to a plan that suits your use, you can save over Rs 750 per month. Even small steps like taking lunch to office (saves around Rs 2,000 a month) or keeping birthday parties at home instead of a restaurant also cut our expenses. If you manage to save even Rs 10,000 a month in the aforementioned ways, congratulations! You have just given yourself a tax free hike of Rs 10,000 a month. Remember: every rupee saved is a rupee earned. 5 ways to tide through the downturn. 5 Shopping can be fun as well as cheap when there’s a sale, look for them actively.